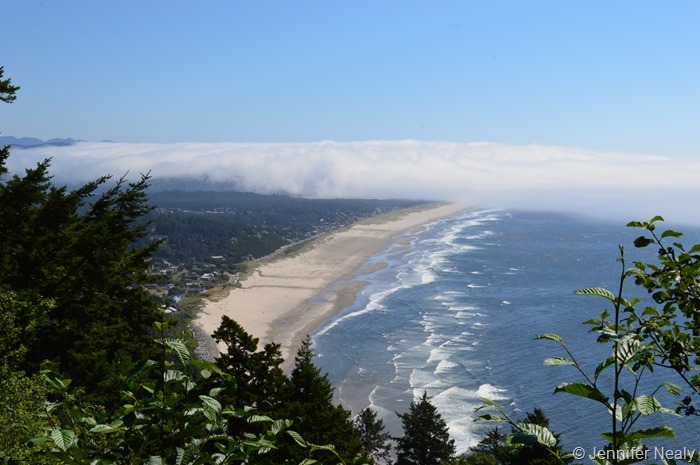 After our week on the Washington coast, we headed south into Oregon. We left cloudy weather, and drove into sunny weather. But then we hit the clouds and fog again. But, wait – then we hit the sun again! Seriously, the weather must have changed 10 times during this 90 minute drive. It was really quite fascinating. 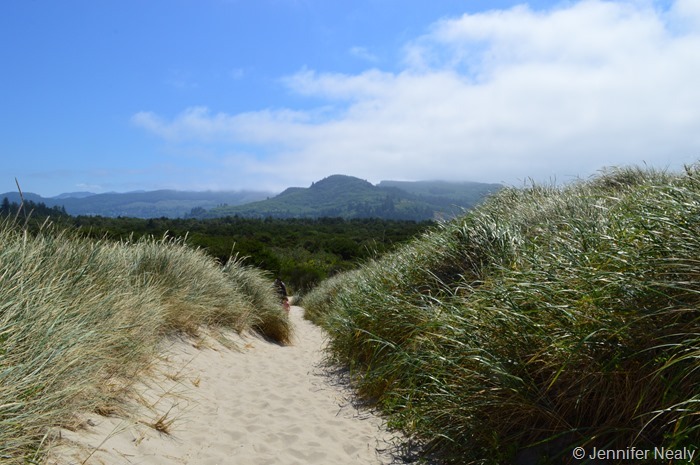 Our destination was the Nehalem Bay State park which is just south of Manzanita. 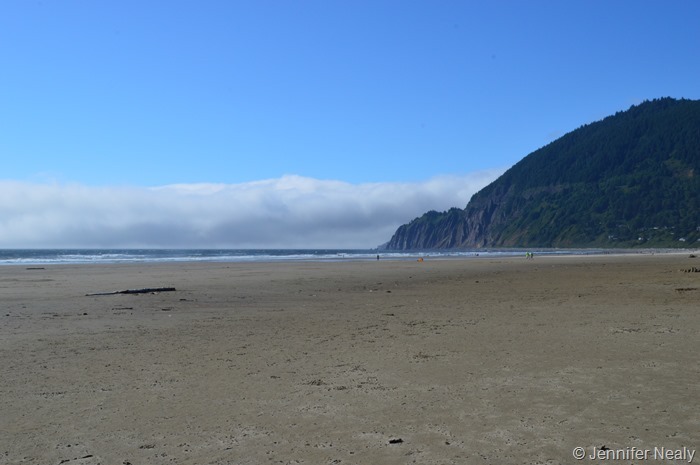 Deas and I visited Manzanita for an hour or two a few years ago, and we knew we really liked it. 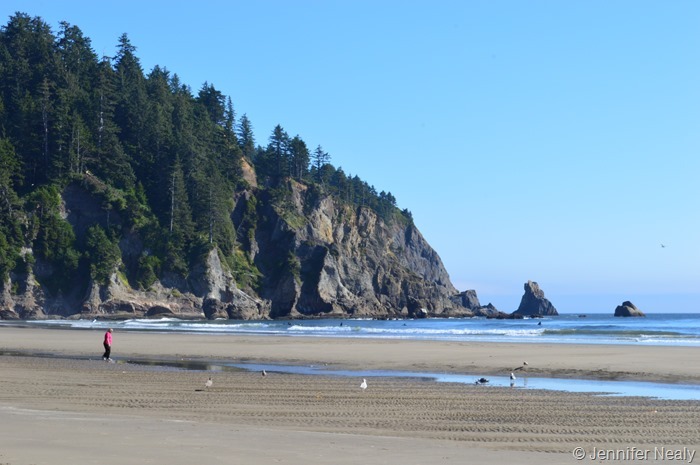 It’s an adorable little coastal town with a few restaurants, cute beach cottages, and a gorgeous beach. We stopped just outside of town to have lunch in the RV at a pullout overlooking the town. The park was really crowded – I didn’t see a single open campsite. Once we got settled we took a walk out to the beach and then through town. The beach was not as crowded! 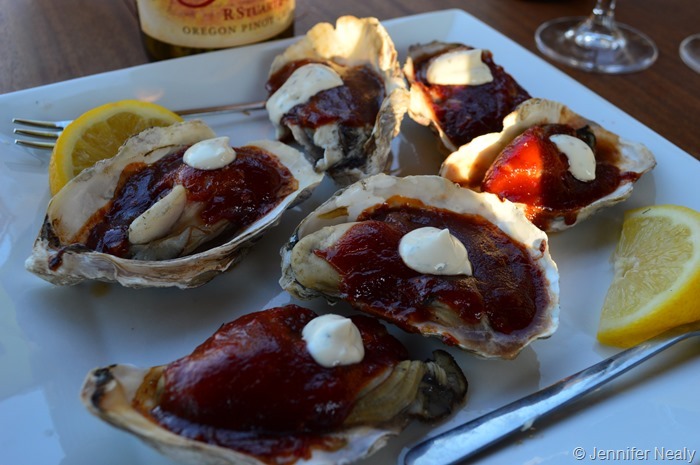 We had a great dinner that night at the Great American Garlic Company – BBQ oysters, crab cakes, and fondue! 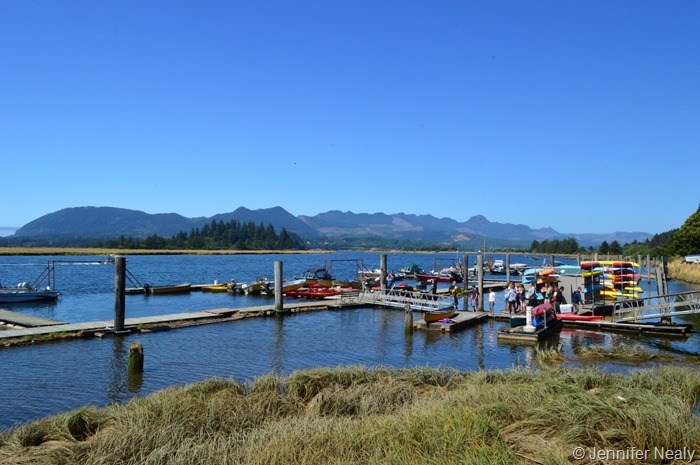 The next day we drove a few miles into the neighboring town of Wheeler, and had lunch at the Tsunami Grill, which has a great view overlooking Nehalem Bay. 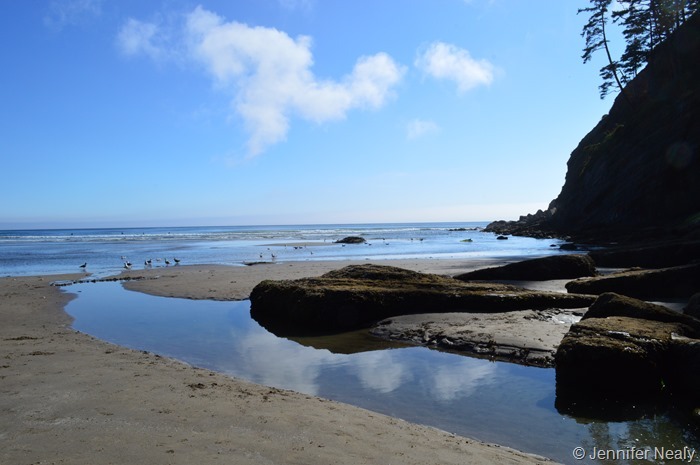 After lunch we explored the nearby Oswald West State Park, which several great trails leading down to a popular beach. Even though we had bluer skies in Oregon than in Washington, it was much colder in Oregon. 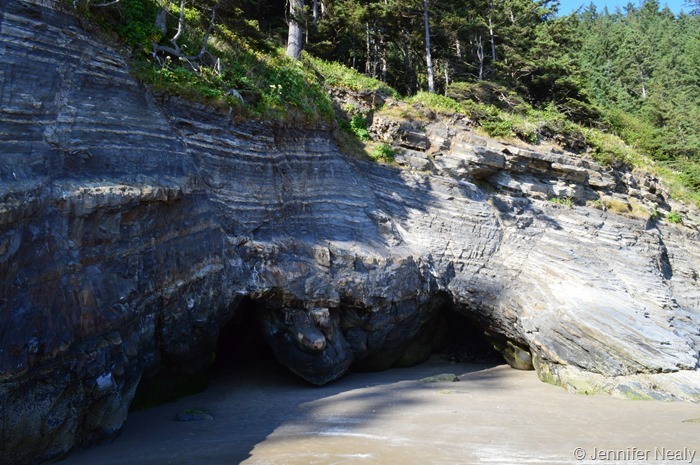 It was so cold the 2nd day that when we tried to walk on the beach, we turned around and headed back – we even had to turn on the heat in the RV both nights! Since our reservations were made only a week ago or so, we only had two nights at the park. We might have extended a trip a day or two if we could, but the park was booked to capacity so we had to leave. But the good news was that our next destination was only a 20 minute drive away! More to come…. LOVE short driving days! Every time we’ve been to OR coast it is in the 50’s (in the summer). We like those temps for getting outside though. It’s a beautiful area! The year I went west, it was sweatshirt (perfect) weather the whole six months until I headed east to heat and bugs. You’re in “eden”, now. Great pictures. Ahhh..so love that area! And love your shots too!